Megamind is the bad, blue, and brilliantly animated villain that commands tears through laughter in this weekend’s revitalizing 3-D masterpiece, which opened in theatres across America on November 5th. Appealing to kids and adults alike with whimsical characters and “PG” rated humor, Megamind will have you wiping clean your 3-D goggles within minutes. The true genius of this flick is the ability of the character actors that include an all-star cast who truly master the art of revisiting Gen X slapstick humor, engaging the same crowd that would go to see The Hangover, and still managing to charm the younger audience through spectacular animation. Megamind (Will Ferrell) is a banter-loving villain with an outrageously large blue head and a mad mission to take over Metro City. 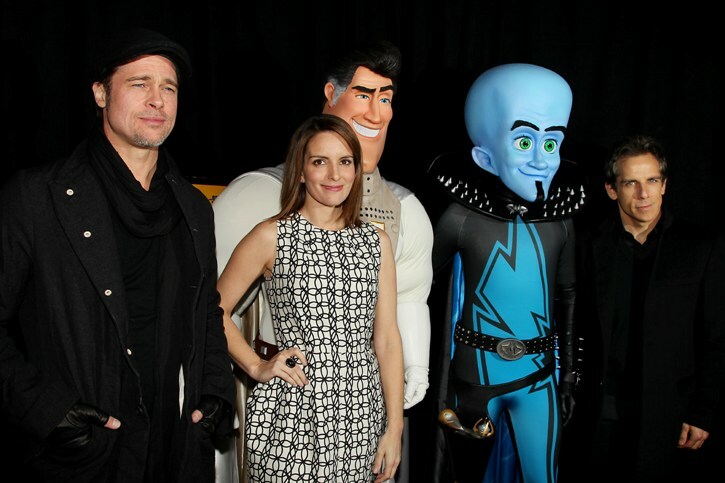 Complete with a faithful sidekick, Minion (David Cross), Megamind spends his days torturing the Metro City mayor Metro Man (Brad Pitt), a larger than life superhero with limitless powers and the will to battle for justice. Luring Metro Man into his evil plot by kidnapping famed journalist Roxanne, (Tina Fey), Megaman succeeds in exterminating his nemesis, and much to his surprise. Feeding off knockabout style humor and well-known characters of the past (who can forget Mugatu? ), the storyline bursts at the seams with villainous antics, mockery, wit, and 70s arena rock as if the Superbowl half-time show went animated and recruited SNL producers. The 3-D animation dazzles with each villainous strike and heroic comeback and you can feel the softness in the velvet underside of Megamind’s cape making 3-D the favored option for viewing. In between the doses of laser light animation and 3-D gimmicks, however, Megamind manages to captivate the audience with each twist and turn of the storyline, beginning when Megamind succeeds in his mission to exterminate Metro Man. With free reign to rule the streets of Metro City under the cloak of evil, Megamind and Minion revel in their glorious success and soon infiltrate the metropolis. Soon after his sinful victory, boredom and melancholy find a home in the big blue head of Megamind, prompting him to create a rival that will rise up against the reign of evil and create the platform for attention he deeply longs for. His mission to find a suitable nemesis begins as he extracts DNA from Metro Man’s cape and creates an archenemy serum to breed his new rival, Titan. Nonetheless, Megamind finds himself in a predicament when he accidently lodges the superhero gene in a nerdy cameraman, Ted (Jonah Hill). In what becomes a battle for rule of Metro City and the heart of Roxanne, Titan and Megamind go head-to-head in a battle of the wits, embracing the well-known character styles branded by the voices of the character actors behind them. Megamind truly shines with pure brilliance in every aspect from the quality of animation to the layered touches of wit and humor that distinguish the cartoon parody. Prepare to laugh, cry, smile, and jump as Megamind takes you on a spectacular journey that rivals even the best superhero plot amongst an overload of comic-based action heroes dominating the theatres.